Poppa had emigrated from Russia. Leaving behind family and friends, but bringing with him his bride-to-be, Esther. In the old country, Poppa had been apprenticed to be a blacksmith. Here in America, he could only find factory work, and had become a presser in the garment industry. The struggle for daily survival was spent in long hours of hard work. Poppa remembered and often spoke of a small village where he had grown into manhood. The village was in the sprawling countryside. Farms and orchards seemed endless to him. His dream was to get his family out of the squalid dirty neighborhood he had come to from Russia and into the countryside. Soon an opportunity was at hand. “A thousand dollars: Itcheh (Isador) exclaimed! “That is what the man told me, but don’t forget, that is only with the condition that you don’t go to look at the property” explained Itcheh’s fellow worker. A thousand dollars for a property in the country is still a bargain, even if I can’t go to look at it thought Itcheh. He barraged the co-worker with questions, but was told “Look, if you are this interested, I will give you the man’s name, address, and telephone number. You get in touch with him, and ask him all the questions you want.” Itcheh waited impatiently for the end of the workday. Finally, changing into street clothes, he hurried home to his wife and his sons, to share with them the news about this place in the country. A thousand dollar bargain! The drive seemed endless. The first glimmer of light came upon us as the car chugged its way up one of the steepest hills we had yet encountered. This was to be the final climb before we came to the area where the old farm was located. Looking out the car window into the dawn’s early light, I saw for the first time the trees, the woods, and the open sky that Poppa had been telling us about. We finally came to the turnoff from the main road, and rode in what we learned later was called a back-road. Our driver slowed down; peevishly he said “where are we going? I’ll ruin my car yet on this rut ridden pot hole of a road.” “It shouldn’t be too far from here. I was told the place is only about a mile from where we turned off from the main highway,” Poppa answered him. Suddenly, rounding a turn which almost took us into a stream alongside the road, we crossed a small bridge and made a sharp left turn into yet a narrower road than the back-road we just left. A moment or two later we came to the property that we had traveled almost five hours to see. We crossed over what was once a lawn. Now the ground was a tangle of overgrown grass, weeds and briars. Upon getting to the house, we found the door locked. However, an open window was found and I was the chosen one to climb through. I did, and discovered the floor to be rotten, as I almost fell through. This almost mishap stopped further exploration of the old farm house. We then walked around to the back of the house and came upon an old red barn and a broken down building which looked as if it might have been a chicken coop. Then hearing the sound of water, we pushed through some heavy brush and came up on the brook which pursued a course alongside the farm house. Our enthusiasm for the property had been steadily becoming less and less. Now the sight of the rushing noisy brook made the long hours in the car suddenly worthwhile. Especially, when Mamma, who until this moment had said very little, and wasn’t seeing eye to eye with Poppa on this venture, exclaimed “This water alone is worth the thousand dollars.” With this expression of approval, Poppa’s dream began to become a reality. The relative loaned Poppa the money, even a little more than was originally asked for. The owner was given his cash, and Poppa had gotten his thousand dollar bargain. Of what use was this bargain if it could not support itself or the dream that had brought Poppa to this place?? Farmers we were not, but Mamma was a good cook – Poppa knew lots of people. The boys were strong and willing and eager to help; and we had been told that working people and their families wanted to go away to the country in the summertime for vacation. This knowledge was enough to start Poppa repairing and remodeled the old farmhouse and convert it into a boarding house for the summer season. 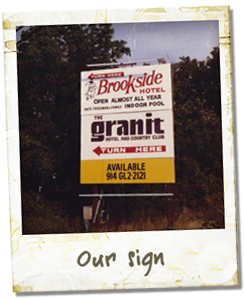 All of us worked hard, and that summer of 1936, the Brookside Inn opened its doors for the first time. This is the story of the way that first effort developed, how the thousand dollar bargain brought with it pain and disappointment, but also gave us the sense of humor that enabled us to overcome the disappointments and establish a rapport with those of you whom we had the great pleasure to call our guests. 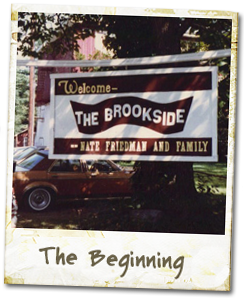 So read on, there may be a chuckle or two as you relive with me the building of a “dream” and the growth of a boarding house called the Brookside Inn. I have been in touch with Marty Lovinger recently but he never mentioned it. I see John Mills often and occasionally speak with Steve Petusevsky, but this reunion never came up! Bobby, Its Randy…Mitch’s brother…hope all is well with you and all the old crew from the Brookside. If you see or talk to anyone PLEASE give them my e-mail address and tell them I would love to hear from them. Thanks and great seeing that you are still around the memory of The Brookside…. From what I’ve heard, I think too many people were excluded from, or did not hear about our last reunion. I think it would be great if someone could create a very visible page or link on this site so people can leave email addresses and/or phone numbers. Maybe it can be done so just the webmaster (Rich?) sees them. This will be a great help if we try to arrange a reunion in the summer of 2012 (and I hope we do) in Kerhonkson as we spoke about at the last get together. It’s always great to see my old friends!! Good idea…I am glad to act as an ’email distributor’ as long as everyone knows that the email will be shared among the ‘Brookside Alumni’. The account was hacked in the past and I don’t want to have anyone get spammed and lost in Malasia without any money as I was supposed to be. I will check with a friend and see what can be done. Just a quick update…my Mother traveled to California to attend her grandniece’s wedding (Seth and John Dunn’s niece Aran). Everyone had a great time.